Parents or legal guardians are responsible for requesting the Sacrament of Baptism for their infant or child under the age of reason. A period of preparation is required for the parents or guardians of those preparing for the Baptism as an infant or child below the age of reason. 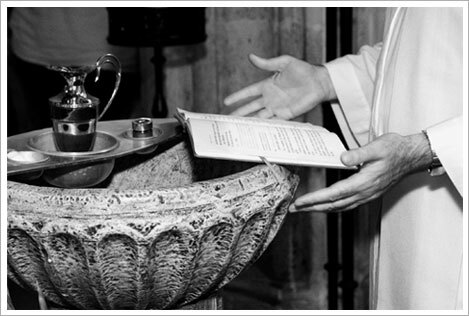 Parents or legal guardians should be registered members of the parish in which Baptism occurs. Preparation and celebration of Baptism of infants and children under the age of reason are to be parish based. A parent or legal guardian wishing to have a child baptized is expected to attend Mass regularly, and must participate in the parish’s preparation program. Parents or guardians must register for the Baptism Preparation Program, complete a baptismal registration form, and present the child’s birth certificate. Consent by at least one biological parent or guardian is a requirement for Baptism of a an infant or child under the age of reason. For an infant or child below the age of reason to be baptized, at least one practicing Catholic must agree to raise the child in the practice of the faith. According to Church law, a godparent must be a practicing Catholic who has celebrated the Sacrament of Confirmation and is at least 16 years of age. Godparents are encouraged to participate in Baptism preparation. The Pastor must verify proper preparation prior to a child’s Baptism. Please call the parish office to arrange preparation: 253-875-6630 or send an email to Parish Office. These three sessions provide parents an opportunity to understand the primary role they have in raising their children in the faith. Click Here for the next times these classes are offered.